Find the peace, joy and love this coming Holiday season with new kitchen solutions! Move over sugar cookies, get sweet and creative this Holidays and have fun fixing your own DIY fruit arrangement that’s edible and made easy with the Flower Power Fruit Vase, shake up some french fries or veggies n’ dip in a French Fry Cone, and keep on time with a Hello Kitty Timer all from JoieShop! Fresh fruit beautifully presented and packaged for gifting, bringing over to your next gathering and also present it as a lovely hostess gift for the Holidays. Put this do-it-yourself from home fruit arrangement together and let it be the conversation piece and centerpiece for your next party. The Flower Power Fruit Vase provides a creative product for children to create with their parents and siblings and enjoy gobbling up fruit shaped flowers with their final project. 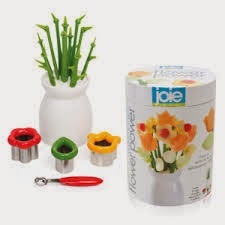 Includes- Display Vase, 11 Flower Stems, Decorative Tulip Cutter, Flower Power Decorative Cutter, Decorative Leaf Cutter, and Joie Mini Melon Baller. The vase base opens for convenient flower stem storage. An amazing and fun solution, a french fry cone that’s a fit for any Party. 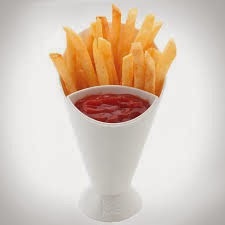 The French Fry Cone & Dip offers a cute gift for the French Fry Lover in your life. Try making healthy baked or sweet potato French Fries, and for healthier fare - try your families favorite veggies and dip - make eating healthy fun with this simple, but fancy little cone. Every little girl loves this whimsical brand now get ready, get set, the timing is great for stocking stuffer ideas to share, or small gifts to get kids ready to cook this Fall and Winter. This Easy to use timer in the kitchen - keeps track of your cooking for 60 minutes and would be a nice tool to work with kids to teach them learning time increments in a fun way. Some other favorites that are now in my kitchen from Joieshop.com are the Collapsible Funnel, French Fry Cutter and Cheese Grater. I use one of these at least on a daily basis and I have to say I LOVE the funnel the most! It stores easily and is great for poring things into small holes without spilling! Help spread the joy year-round with delightful kitchen housewares from Joieshop.com to help you create delicious meals, decorate your kitchen and elevate your mood. Make cooking and entertaining fun for the whole family!